Qualtrics, the leader in experience management, announced today the availability of a mobile in-app software development kit (SDK) available for its comprehensive Qualtrics Customer Experience (CX) Platform. The Qualtrics mobile in-app SDK, available for iOS and Android platforms, and accompanying designer portal, enables brands to quickly and easily build branded customer feedback experiences that originate directly from the brand’s own mobile app. Qualtrics announces the availability of a mobile in-app software development kit (SDK) for its comprehensive Qualtrics Customer Experience (CX) Platform. The Qualtrics CX Platform is built for a mobile-first world. For today’s constantly connected consumer, an engaged and meaningful experience is not only coveted, it is expected. Qualtrics enables brands to stay constantly connected to the voice of the customer through investments such as the mobile in-app SDK. 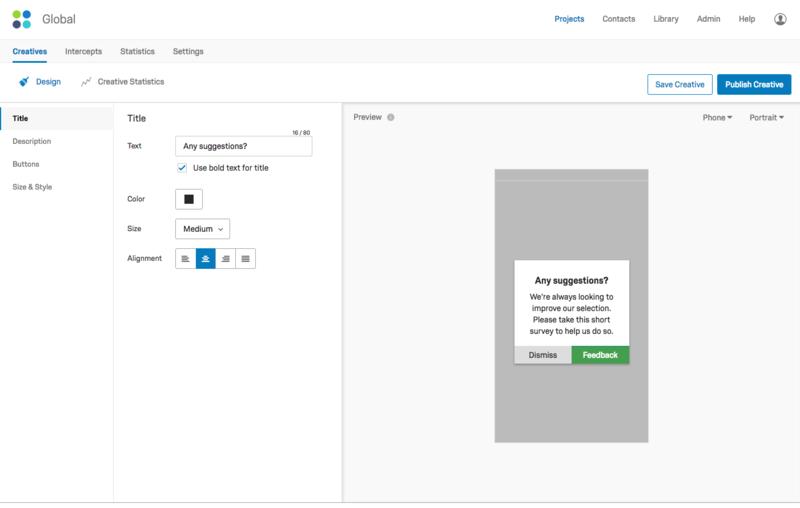 This new designer portal allows digital managers to easily design the feedback experience, including look and feel, and provides dynamic control of numerous targeting triggers without the need to update the app again. The designer portal is part of the newly enhanced website and app feedback experience that is deeply integrated with the Qualtrics Experience Management (XM) PlatformTM. Now, CX teams can work in the same platform (under a single login) and have a consistent end-to-end experience across survey editing, dashboards, analysis and digital intercepts. The Qualtrics CX Platform is the most advanced end-to-end platform for measuring, managing and improving the customer experience. With industry-specific expertise and comprehensive implementation support and services, Qualtrics helps businesses build the competencies and capabilities they need to improve customer acquisition, retention and loyalty. With an emphasis on increasing customer share of wallet and reducing cost-to-serve, the Qualtrics CX platform can drastically benefit the bottom line as well as help increase brand awareness and equity. To learn more about Qualtrics’ comprehensive CX platform, please visit qualtrics.com/customer-experience. Qualtrics is a single system of record for all experience data, also called X-data™, allowing organizations to manage the four core experiences of business—customer, product, employee and brand experiences—on one platform. Over 9,000 enterprises worldwide, including more than 75 percent of the Fortune 100 and 99 of the top 100 U.S. business schools, rely on Qualtrics. To learn more, and for a free account, please visit www.qualtrics.com, or connect on Twitter, Facebookor LinkedIn.